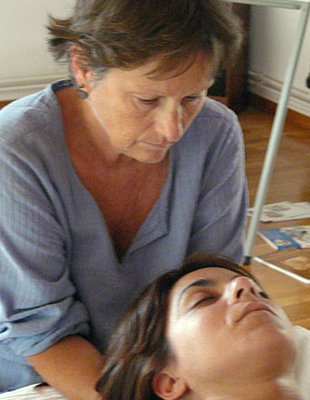 Craniosacral Osteopathy is gentle, deep body work that re-establishes psychosomatic balance. The craniosacral system is intimately related to the nervous, musculoskeletal, vascular, endocrine and respiratory systems. Craniosacral Osteopathy is a non-invasive manual therapy that comprises different levels: body, mind and emotions. Osteopathy not only treats the more commonly known ailments of low back and neck pain, but also treats headaches, migraine, digestive problems , sinus and ATM problems. Our emotional states –stress, excitation, repression, etc.– are reflected in our characteristic muscular patterns and postures. Osteopathy can help during pregnancy and also post partum and helping with stress. In children, it can help in cases of repetitive ear infections, colic or concentration difficulties and much more. Therefore another of the benefits of this body therapy is an increase in energy level and relief from stress. It originated in the 1930s in the United States with Dr. Sutherland (1873-1954) and its scientific development. To the classical systems of the body (the nervous, musculoskeletal, vascular, endocrine and respiratory systems) we can add the craniosacral system. There is a rhythmically flowing mobility between the cranium and the sacrum and, in contrast to the other rhythms, it can be evaluated and corrected by palpation. The method involves the application of various manipulations or techniques that have been scientifically developed over the years. They use the bones of the cranium, the neck, the vertebrae, the base of the spine and the soft tissue of the whole body as a means of evaluating, liberating and balancing the body. It is a relaxing therapy that supports the natural ability of the body to cure itself and helps to increase vitality and wellbeing. Craniosacral Osteopathy is extremely gentle and profound and can be applied to both adults and children and even to babies. As it works on the organism as a whole, the session can be of assistance in numerous situations and will complement any medical or psychological treatment. In the absence of a specific pathology, it helps eliminate tension and blockages in the body and mind so that you can live life more to the full and with increased physical vitality. Digestive problems: stomach acidity, constipation, etc. Treatment in relation to the mouth, TMJ, bruxism, etc. Complementary therapies neither replace nor interfere with medical or psychological treatment.